Barring any unforeseen event, I probably made my last visit to Mendel Glacier on August 13th. During this visit I discovered no new pieces of wreckage though I did spot some smaller pieces. It is my belief that without a large team of people to help comb the rock fields of the glacier, the use of ground-penetrating radar, and with a cadaver-smelling dog to lead the search, that the remains of William Gamber and John Mortenson will never be found. 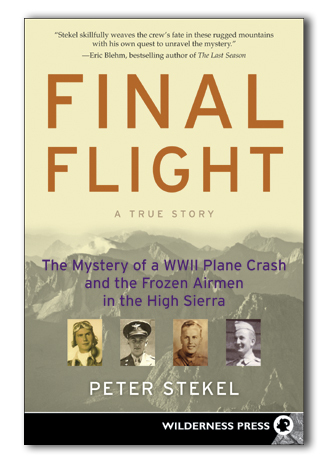 In previous posts I have mentioned the attempts of History Flight (www.HistoryFlight.org) to ferry a team of helpers and a cadaver dog to the glacier via helicopter. This would require the permission of the National Park Service. History Flight has submitted a permit request and has received provisional permission for three days of flights with one flight occurring in the morning to bring in team members and a second flight in the evening to take team members out. However, the NPS has found ways to delay the mission by interjecting various impediments and it looks unlikely that any 2013 History Flight trip to Mendel Glacier will take place. As for 2014..? 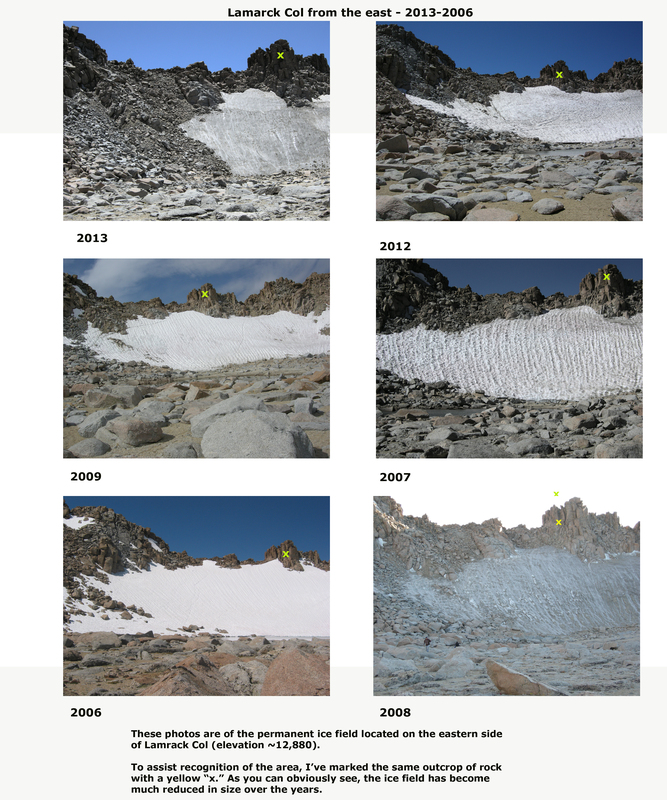 I am posting some comparison photos so you can see how much the glacier has changed over the years since I first visited in 2007 - the year I found Glenn Munn's remains. The most obvious change in Mendel Glacier that I've observed over the years is the decrease in the amount of surface ice. 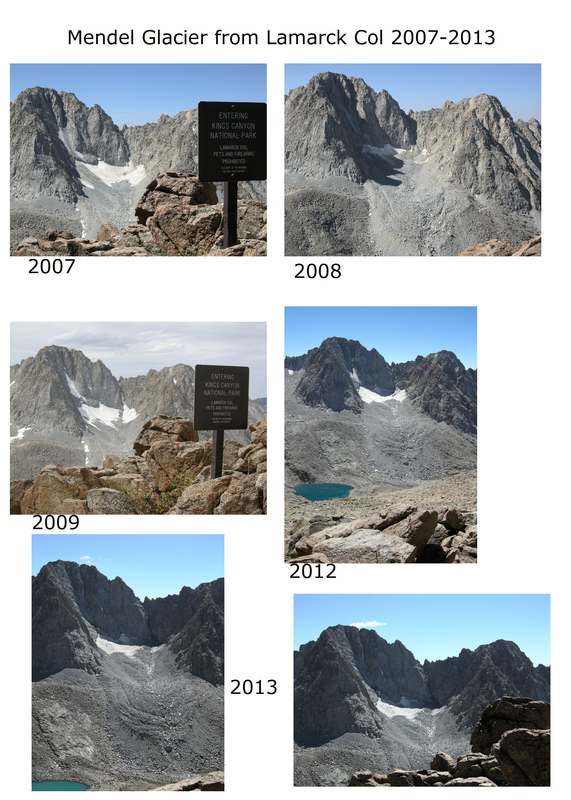 The area of glacier appears to have been reduced as much as 30% and there are some places where large blocks of talus are perched on ice pedestals from 5-8 feet tall - indicting the glacier has subsided by that amount. Recall that Mendel Glacier is a "rock glacier" and consists of an amalgam of ice and various sized rocks (from gravel- and sand-sized to automobile-sized rocks or talus). 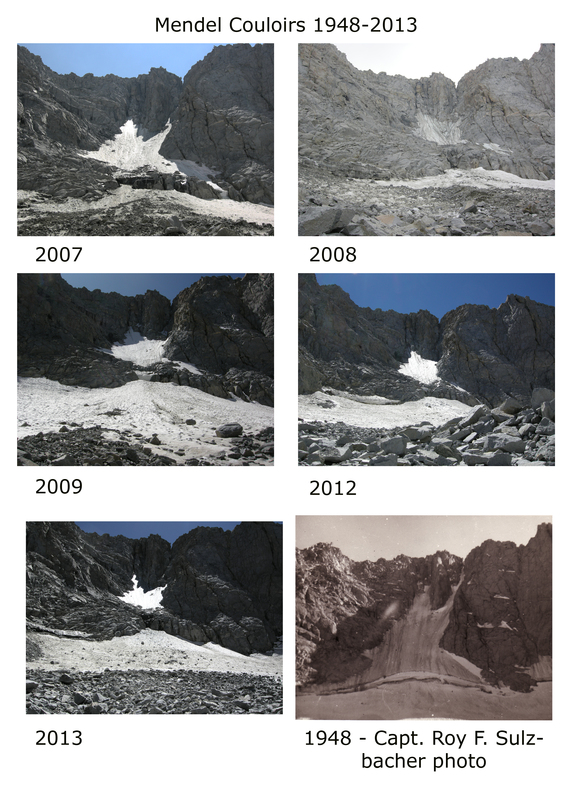 Unlike a "clean glacier," which is essentially a large ice cube, rock glaciers melt, or subside, in place. Whereas a clean glacier will melt upwards into its bergschrund, rock glaciers melt in place, getting thinner and thinner until the ice is all gone. This is a slower process than on clean glaciers because the rock debris on and in rock glaciers serves to insulate the ice and retard melting. Though the surface ice on Mendel Glacier appears to have disappeared over 30% of the glacier's area, there is still plenty of ice below the rock layer. These composite photos are large files. Click on the thumbnail image to see the larger image version. All these photos were taken by me (copyright Peter Stekel, 2013, all rights reserved) except where noted. The View of Mendel Glacier from Lamarck Col. The permanent ice field on the east side of Lamarck Col.